BlackBerry has started to monetize BBM, using things like sponsored BlackBerry Channels and the sale of stickers for members to use. According to the company, stickers are like emoticons, just larger and with more beautiful images. Coca-Cola has issued a set of limited edition stickers in conjunction with the World Cup. For those who are not sports fans, this is a global football soccer tournament held every four years. Other stickers include a set of Nummies. 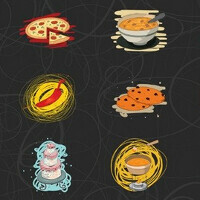 These are stickers with a food theme, that were designed by Canadian artist Andre Jolicoeur. These stickers were originally designed for Indonesian BBM members, but there is a glitch that can be exploited. All you need to do is ask someone in Indonesia who has these sticker packs, to send you just one sticker from each pack. Once you click on them, you have the opportunity to pick them up yourself, no matter where you live. Until BlackBerry exterminates the bug that allows you to score regionally placed sticker packs, you can ask your BBM contacts to keep sending you stickers so that you can collect the whole set. It might not be Pokemon, but there are some out there who just have to "catch 'em all." Stickers for children. John Chen's brilliant strategy. Oh so according to you BlackBerry is releasing these stickers? So much for reading the article and commenting on it. I never knew BlackBerry owned Coca Cola, thanks for this new found info.. +1 to you. "BlackBerry has started to monetize BBM, using things like sponsored BlackBerry Channels and the sale of stickers for members to use." First sentence.